A good shower head can rejuvenate your body after every shower, just like this unit, WantBa 6-inches Rainfall High Pressure Shower Head. Featuring 2.5 gpm flow control, this shower head fits standard U.S. plumbing connection, you’ll be able to enjoy consistent powerful spray performance even when the water pressure is low. 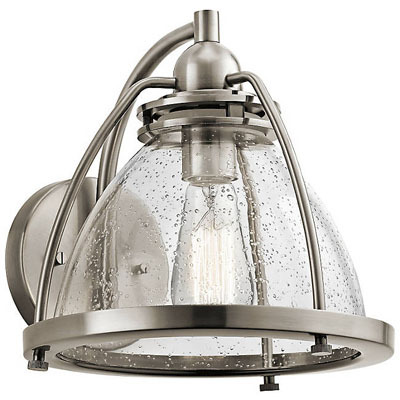 The quality of this unit is similar to those showerheads that you can find in hotels. Just in case you haven’t noticed, this unit comes with regulator separately, that is the little circular peg in separate ziplock bag that comes with the box. So be sure that you install it. However, by removing the regulator, you’ll get more powerful rainfall. Always keep a body scale in the bathroom, it’s a great way to keep track your body weight throughout the day. 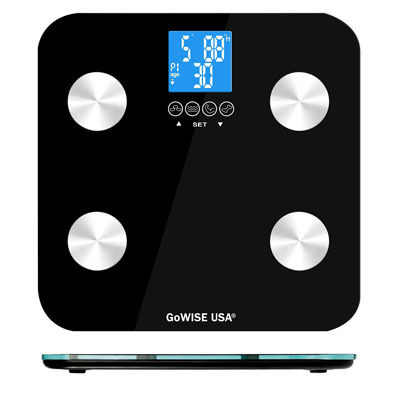 If you don’t have it, we’d like to recommend GoWISE USA Body Fat scale. This product measures not only your body weight, but also your body fat, water, bone and muscle mass through its Bio Impedance Analysis (BIA) technology. The tempered glass platform makes it look elegant in your bathroom, underneath that glass there are multiple sensors to measure everything. This scale can keep information for up to 8 users, it has an auto-on function, LCD display with LED backlight, a touch switch, and can accommodate up to 400lbs. Reliable bathroom hooks are pretty essential equipment in every bathroom, just like Delta Faucet 79635 Windemere Robe Hook. Windemere is one of stylish Delta collection, featuring sculpted curves and whimsical design. Just in case you want to get a matching set, there are also toilet paper holder and towel ring with the same color whether it’s oil rubbed bronze, stainless steel, or brushed nickel. This robe hook features traditional styling, it displays class and timeless design, it works great to hold your robe or towel. The installation requires you to drill holes onto the wall, install the expansion anchors, and continue install the screws. Please follow the instructions, especially when you have tile walls, it can be pretty tricky, if the hole is too big, you won’t be able to install the screw, but if the hole is too small, the screw can crack the tile. 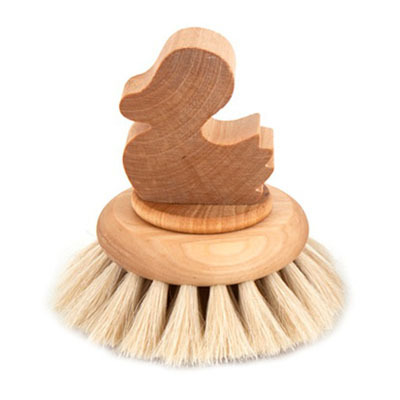 Cute Horsehair Duck Soft Brush is perfect for children or anyone who enjoys gentle approach to bathing. Soft and luxurious horsehair bristles are nestled in an oiled-hardwood handle with the shape of a duck, the wood comes from responsibly-managed forests. These bristles are gentle to your skin. Carefully hand crafted by following a century old tradition, each piece is assembled by visually impaired craftspeople in a small factory in Stockholm. Wouldn’t it be nice after a long day at the office, you can go home and enjoy a good shower and a massage? Well, this showerhead offers you all that, AquaCare 4-in-1 Rainfall Combo with Hand Shower and Rotating Hydro-Brush Massager. 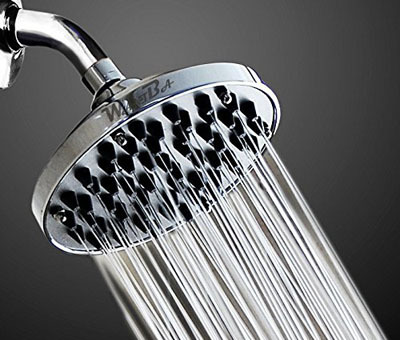 It’s all-in-one bathroom product, an ultra luxurious 6-inch rainfall showerhead that features high power 3-zone click-lever dial, rub-clean jets, and 6 pampering settings. This showerhead features split-zone dual chamber design, it means that you can conveniently choose to enjoy showerhead or use handheld shower. 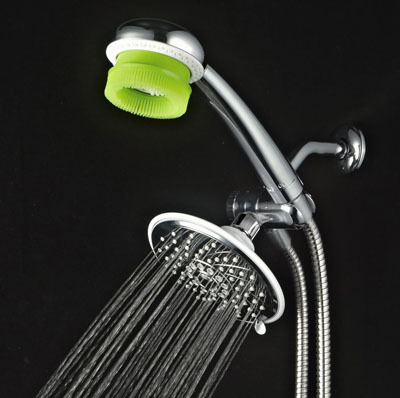 The 3-in-1 rotary hand shower that can be used as rotary HydroBrush with rotating attachments, manual thanks to its stationary attachment, or just conventional hand shower. The 3 water flow settings allow you to handle flow control and with 2 snap-on attachments that can be activated by running water and on/off rotation switch. Yes, it is powered by running water, which means you don’t need batteries or electricity. Need a bench in your bathroom? 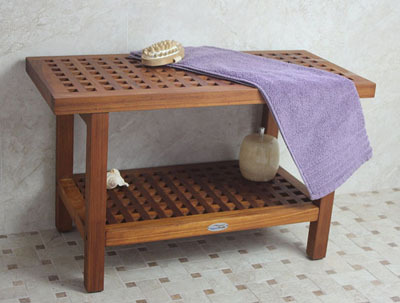 Take a look at this beautiful AquaTeak Original 30-inch grate teak shower bench, the material is imported from Indonesia. The teak is certified by the Indonesian government to be sustainably harvested from maintained teak plantations. Teak has been known as the best wood for outdoor and indoor moist environments, it’s been used in yachts and ship building for hundreds of years, you can be sure this bench offers the same quality. This solid teak wood bench is perfect for any location, not just as shower bench, it is naturally water resistant with amazing versatility. This bench features stainless steel non-corroding hardware and adjustable rubber gripping feet to give you better stability. Aside from being a great bench, you can also use it as a coffee table or a nice shelf for extra storage. 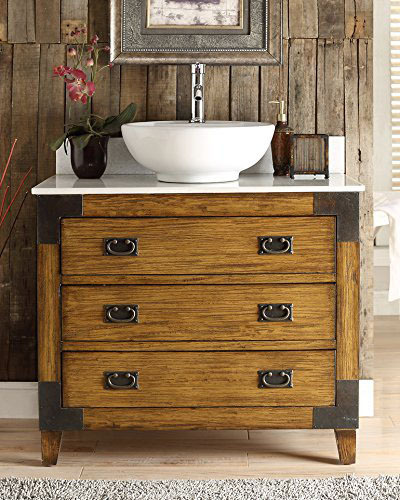 When buying sinks and vanity sets for our bathroom comfort and easy assembly are just a few of the many things we would love to enjoy and we can have it when we purchase the Benton Collection Asian-inspired Akira Vessel Sink Bathroom Vanity. This vanity set from Benton Collection is not only easy to assemble but is fully assembled by the manufacturer prior to delivery. The set comes with a countertop and a pre-installed sink. Beautiful bathroom needs beautiful vanity set as well, if your bathroom décor is modern contemporary, we’d like to recommend Kokols 23-inch Single Bathroom Vanity Set. This vanity set features combination of contemporary Italian and Swiss style, it is constructed from high quality metal to make sure its strength and longevity with a clear finish glass top. 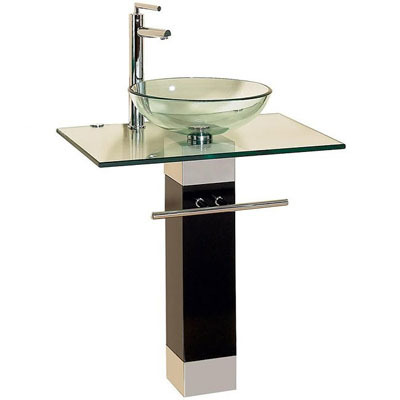 The stainless steel base comes with chrome finish, it is visually appealing for a modern vanity.